The coordination polymerization of small olefins and the oxygenation of hydrocarbons are examples of catalytic processes, which have inspired our preparative and mechanistic work with transition metals. You can watch a short video on homogeneous chromium polymerization catalysts below. Our approach involves the synthesis of 'unusual' molecules (by virtue of their oxidation state, spin state, electronic configuration, molecular structure, reactivity, etc. ), their full characterization with various spectroscopies and other suitable physical techniques (i.e. electrochemistry, magnetic susceptibility measurements, X-ray crystallography), and finally the elucidation of their reactivity with organic or inorganic substrates. Based on the notion that open shell organometallics or 'metallaradicals' should exhibit novel reaction patterns, we are working on a variety of paramagnetic chromium alkyls. Here we are utilizing changes in oxidation state to tune the reactivity of these extremely electron deficient compounds. Results from this research include active ethylene polymerization catalysts, compounds with unusual magnetic properties, and stereoselective carbon-carbon bond formations with possible applications in organic synthesis. This project is currently supported by the National Science Foundation under Grant No. CHE-0911081. Another current project focuses on the activation of dioxygen and other readily available oxidants with transition metal catalysts. 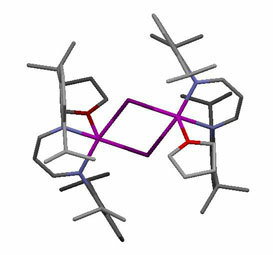 We are taking advantage of the unique steric characteristics of highly substituted tris(pyrazolyl)borate ligands in stabilizing coordination compounds of small inorganic ligands. These complexes engage in electron transfer and atom abstraction reactions. This project is currently supported by the department of Energy under Grant No. DE-FG02-92ER14273.